That public hearing should never had happened. Kavanaugh should have been confirmed. The side show should have remained behind closed doors. That hyper-politicized circus was complete with prepped players, cynical clowns and political trapeze artists. They have spent years planning for opportunities like this and they are taking full advantage of the audience—us. Wake up America. You are being brainwashed. They are hoping we somehow keep tuning into the sideshow and lose interest all together of the task at hand. They are counting on an audience of future voters, prone to being easily swayed. As a psychologist who analyzes human behavior for a living, I see exactly what is going on. I see the big “three-ring-circus” picture. I see the distractions, the cognitive manipulation and the attempt to further dumb down the American people. The letter Dr. Christine Ford wrote was given to Democratic Senator Diane Feinstein, in confidence–months ago. Dr. Ford sought counsel from a therapist specializing in repressive memory—a very controversial form of therapy as more times than not, the information is either false or distorted. Usually this kind of “repressive memory testimony” is inadmissible in a court of law due to inconsistencies. It certainly has never been used solely to garner a conviction. When that trust was broken, Dr. Ford was actually mortified. She had no intentions to become an active, public participant in this Democratic debacle. In my professional opinion, we shouldn’t be focusing on Kavanaugh, an FBI investigation, or Jeff Flake, but instead on the villains of this story, starting with the one who leaked this vital information. But again, they will get away with it by distracting our attention. Dr. Ford underwent a polygraph test. The results showed there were two questions asked and the name “Kavanaugh” was never mentioned. Purporting to claim anything else is criminal. Another very detrimental, falsified and unethical move by the Democrats. But again, they got everyone thinking and again, we were distracted. These are not stupid people. This was simply another way to cognitively manipulate the general public. It is also important to note that when questioning individuals who have undergone events that may be perceived by the brain as a trauma early on in life, the rate of inconsistencies is exponentially high. Over the course of several years, names, faces, places and timelines can become distorted in the mind. That is a proven, researched, fact. What do we know about Dr. Ford, a woman giving testimony after being prepped, guided, and questioned about an event that happened right on the other side of middle school. She was a known partier, was known for “hooking up” and was definitely not the poster child of morality. Was this mentioned? Of course not, but Brett Kavanaugh’s yearbook was opened and every detail of his teen life scrutinized. Leftist tactics. Psychological games. Do I believe something happened to Dr. Ford one night during her high school years? I do. But this wasn’t it and I hate that the Democrats used her the way they did. To me what they did is far worse than whatever may have happened to her over 30 years ago. Next, we see that her personality change during her questioning was all too revealing and indicative of past abuse. When delicately questioned by the Democrats, her body language and behavior spoke volumes. When addressed by the Democrats, a middle school aged “Dr. Ford” appeared. I noticed the extreme change in her body language and behavior. Her shoulders shrink down, her face drops, she blinks repeatedly and her voice is soft and high pitched. She became that lost, adolescent victim right before our eyes which perfectly played into the scheming Senators’ plan. With just the right questions, using the perfectly rehearsed intonation, Dr. Ford is lured into becoming a young girl, right there on the stand. The brilliance in this is that once she regresses to that helpless teenaged girl, the audience sees that. The Senators are now able to manipulate the mind of the audience. Instead of having us picture this event occurring between two teenagers, they want us to believe that this happened between a 54-year-old man (Kavanaugh) and this “innocent” adolescent girl they have now evoked and put on display. A sick tactic, but brilliant really. When addressed by the Republicans and Prosecutor Rachel Mitchell, Dr. Ford sat up straight, lowered her voice, looked dignified and answered the questions. Her answers to these individuals, I believe were truthful, showed appropriate uncertainty and inconsistency as one would show giving 30 plus year old testimony. Again, I believe Dr. Ford experienced a traumatic event in her teen years. I truly do. No amount of money paid or notoriety promised would make someone of her stature willingly volunteer to come forward with this information. Her behavior shows clear evidence of a deeper pattern of hurt, and further perhaps, a legacy of poor decisions. There are personal demons within her. There is shame. There is regret. I don’t even think Dr. Ford’s behavior was all planned. I think we saw the real Christine Ford in some of those moments. A shamed teenage girl, perhaps with a weak moral foundation, who had become a rudderless vessel due to poor choices and sticky situations. Then what do we make of Judge Kavanaugh? Was he a part of this questionable past of hers and was his behavior in this hearing indicative of this? He presented himself as a family man, good father, caring husband, fair judge, moderate in his political beliefs. Perfect? No. Corrupt? I would say after assessing his actions, behaviors, responses and performance, overall, no. Testimony shows that he was definitely not a saint in high school and we as conservatives must not revere him as such. He was a partier, a jock, a good friend, a charismatic young man who people were drawn to. He was a decent student, intelligent, pulled pranks, had a few girlfriends and apparently drank a lot beer. Nothing more, nothing less. His present life actions and behaviors, show that he has moved on from his high school antics, and locker room life and is now a different man. And His testimony was strong and consistent. His reputation seems more superior and notably impressive than most of the politicians in that room. His gift of organization, memory recall and facts was not only reliable, it was unchanging, relevant and on par with the life he has led for many years. No surprises, no hesitation from those who are a part of his everyday life and no real inconsistencies whatsoever. This is what I look for when assessing an individual for reliability and competence. Consistency, collaboration, and confidence are key elements. I want to see that their everyday actions match what they are saying and I saw this with Judge Kavanaugh. Whether or not Kavanaugh was or was not the most upright, moral man in the room, he passed my psychological sniff test with flying colors. At the hearing, he came out of the gate ready to fight for his life, his family, his character and what was left of his dignity. He was consistent. He was forthright without being overly defensive. His body language was honest and within the normal range of a 53-year-old man. His mannerisms were appropriate and his intonation in line with his chronological age and professional position. He was respectful, answered the (very few relevant) questions he was asked and was as gracious as one could be in this uniquely twisted situation. He showed great restraint when condemned, belittled, and provoked and his emotions were appropriate, especially for someone in a no win situation. If he had appeared stoic, they would have said he was heartless and didn’t care. If he had shown apathy, they would have said he must be guilty. If he was too emotional, too quiet or too tearful, they would have said it was forced, prepped, weak and not credible. Though doomed from the start, he somehow managed to escape with his dignity in place. He had an honest, human, reaction. It was a well-balanced display of real emotion, real feelings, and real pain. He came out as a warrior, as a caring husband and father and appropriately so, a mildly defeated man who was grasping on to any shred of his character the Democratic wolves had not ripped to pieces. I believe he won the hearts of more Americans than the Democrats in that room will ever admit. We witnessed this evolution of the soul, together, as a nation of conservatives united. God showed up and we felt it. Kavanaugh entered into a fiery hell and was bombarded with slanderous questions, emotionally ripped to shreds by politicians with vile intentions and weak character, and he miraculously came out of it a stronger, wiser, and more qualified than we perhaps ever knew he was. This was the perfect storm in which Democrats thrive. This was all well-planned, purposeful and pathetic at best. This hearing was a psychological mind F*&%. This hearing has become a National disgrace. It showed depravity. It revealed more about the character of our representatives than the Judge and the Professor. The Senators behind it have done irreparable damage and should be charged with defamation of character and we need to hold them to it. The tactics they used to willingly manipulate the public, smear innocent individuals and destroy families, has broken down a part of America’s heart and we need to make our voices heard. They have misrepresented themselves, they have psychologically manipulated the public through omission of facts and middle school tactics. They have made a mockery of the American judicial system and they should be voted out. This isn’t about political party. This isn’t about men vs. women. This isn’t even about inappropriate sexual behavior.This is a personal attack against the conservatives of America and the very foundational values of this country. This a battle of good vs. evil. This was an American political process, that went very wrong. We must no longer be silent while these inept politicians further attempt to brainwash us into thinking we are powerless. They exposed themselves for what they are and I declare war. 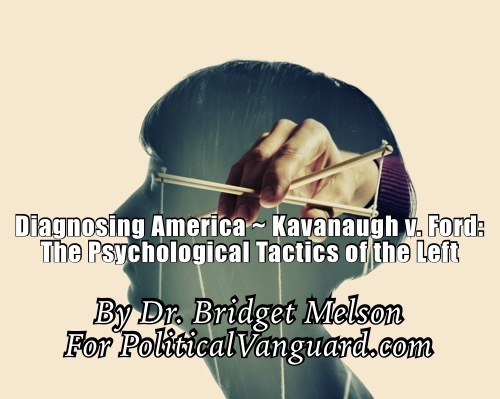 War on the psychologically manipulative left. War on the evil that permeates Washington D.C. War on those who continue to slander us. War on those who are trying to replace morality with corruption. If we don’t rise up, we will see more “Dr. Ford’s” and “Brett Kavanaugh’s” brought to the political guillotine while we stand by helplessly and watch. We must stand and rise from the shadows. We must speak up and often. We must choose good over evil. We must arm ourselves with wisdom. We must engage and we must walk our talk. We must write these corrupt individuals, we must (respectfully) speak up to those around us and we MUST let our voice be heard with our vote. We the people, have the power to turn this around, and if we do so with dignity and respect, justice and truth will ultimately prevail. Stand warriors. Speak up. Write your Senators. Vote your mind. For united we stand, divided we fall. Keep fighting the good fight and may God Bless America.